A long range transmitter combined with an internal battery and charger/power supply means that the unit always has sufficient power to transmit signals effectively - even during extended power failures. Choose between the 2.2 AH and 7 AH models, depending on your application. 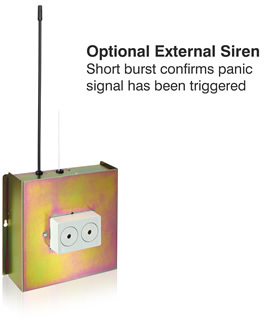 The optional short range receiver turns the unit into a quick to install all-in-one panic alarm system. Long range panic signals can be sent from a remote panic button/s. Ideal for installations where the transmitter is mounted far from the control panel and needs to be powered independently. A tamper switch on the lid will report any unwanted tampering and the ability to monitor the trigger cable (optional on TX 790C) makes the unit ideal for high risk applications. 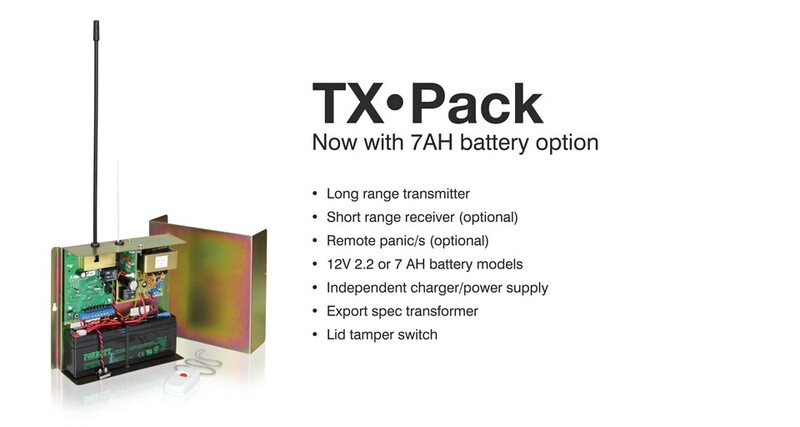 The TX Power Pack is a rugged, proven product already popular in areas of Africa where power supply is often not reliable. The units are built to the highest quality standards using surfacemount technology (SMT) and top quality components. Ideal for estate agents at show houses, old age homes, panic for guards, cash points etc. Allows up to 4 different remotes to be used. The user who pressed the panic button can be identified at the control room. • Low battery load. Draws only minimal current in standby and 1,5 A in transmit. • Super-long battery life. Continues to operate during extended power failures. Choose from a 2.2 AH or 7 AH gel-cell low maintenance battery. • Rugged, export model transformer. Designed to cope with Africa's harsh conditions and unstable electricity supply. • Battery low shut off. Low battery sensing circuit will automatically disconnect the battery from the unit to prevent battery damage during prolonged power failures.